With this lovely breeze and cooler weather in Chicago, the fashion doors have opened and I am back to looking through my pants and long sleeved tops! 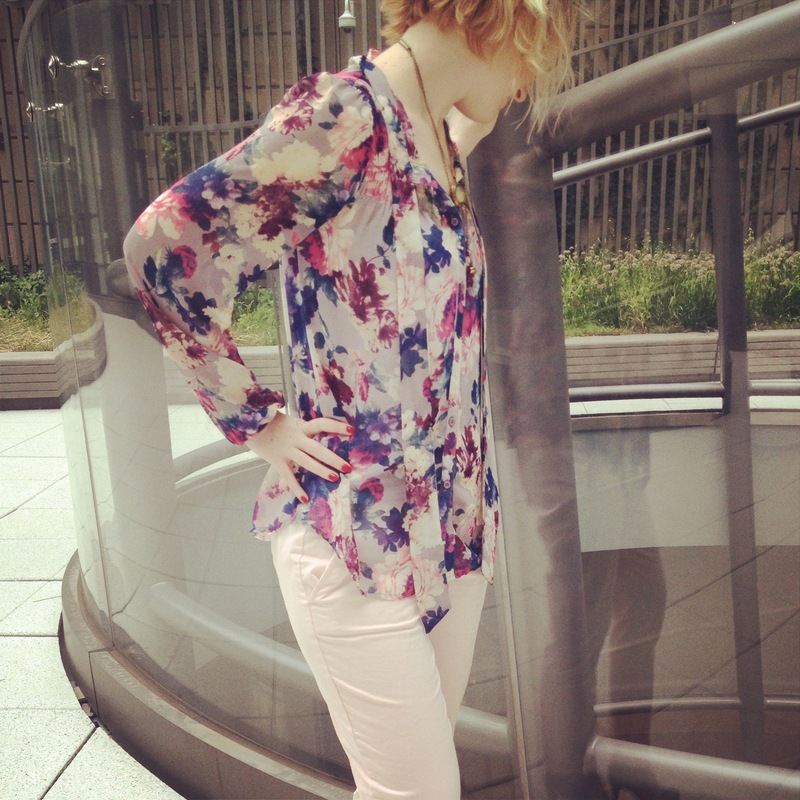 I opted for a sheer floral top today with my pastel pink pants. You can never have too much pink, in my opinion. 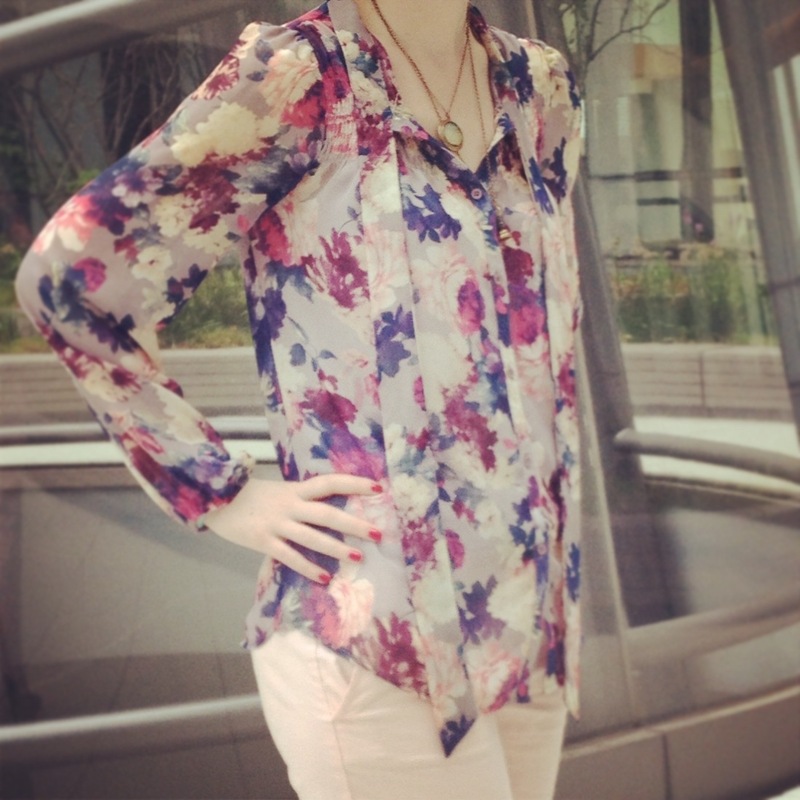 In the picture below you can see the floral detail and how there are two pieces of fabric (ties) that hang down the front of this shirt. Personally, I like to leave these pieces untied for a laid back look, but the top does look great with the fabric ties in a bow as well. To dress the look up a little, I added my metallic heels. 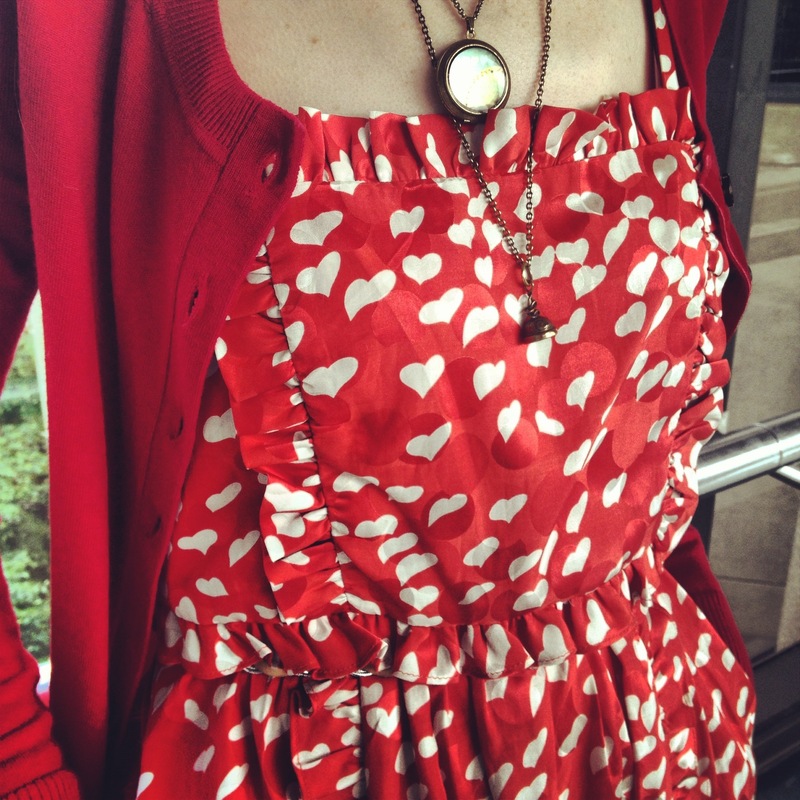 There is no red in the top, but I think the red nails are in theme with the romantic and feminine vibe of this outfit. 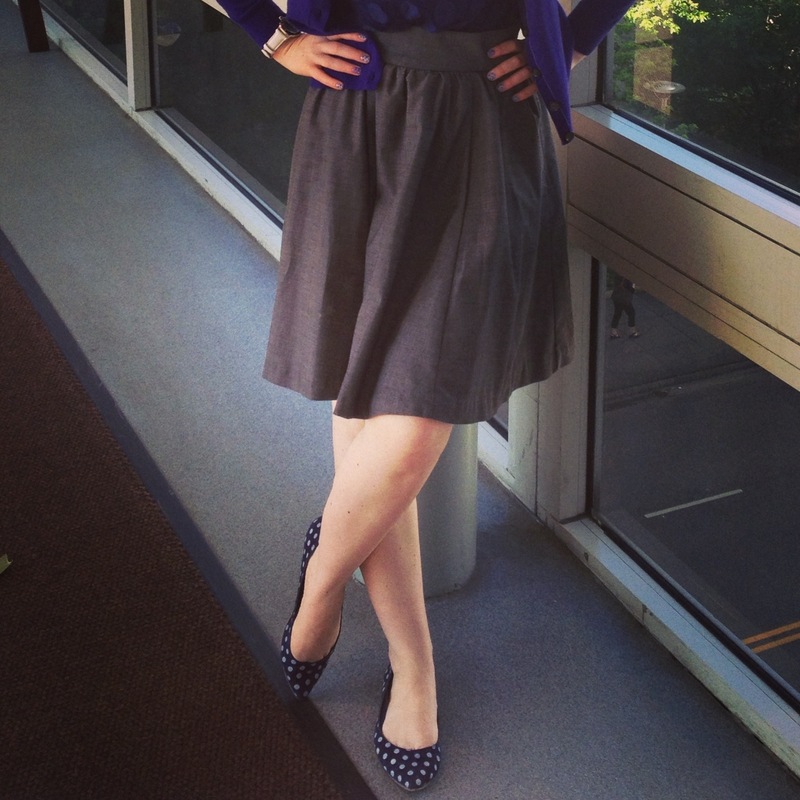 1) I do try and practice what I preach when I’m putting together my daily work ensemble. 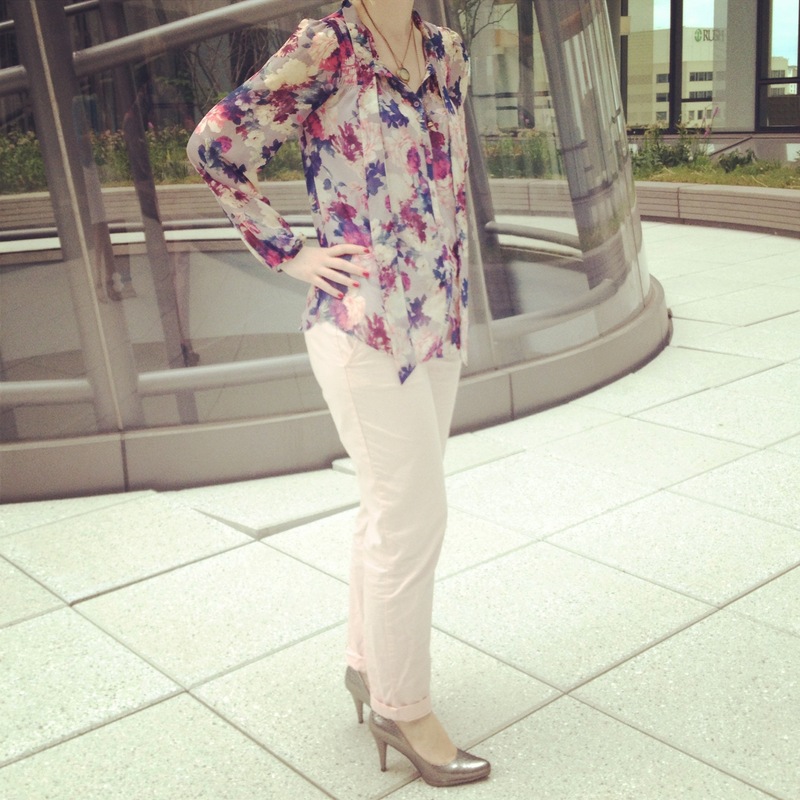 With this outfit, I thought pink khaki pants might not make sense with a sheer top, but I tried them together anyway. I was surprised at how much I liked this pairing. The whole vibe of the outfit is very feminine and breezy, but the heels keep it from looking too laid back for work. 2) I posted about DSW yellow stickers yesterday. 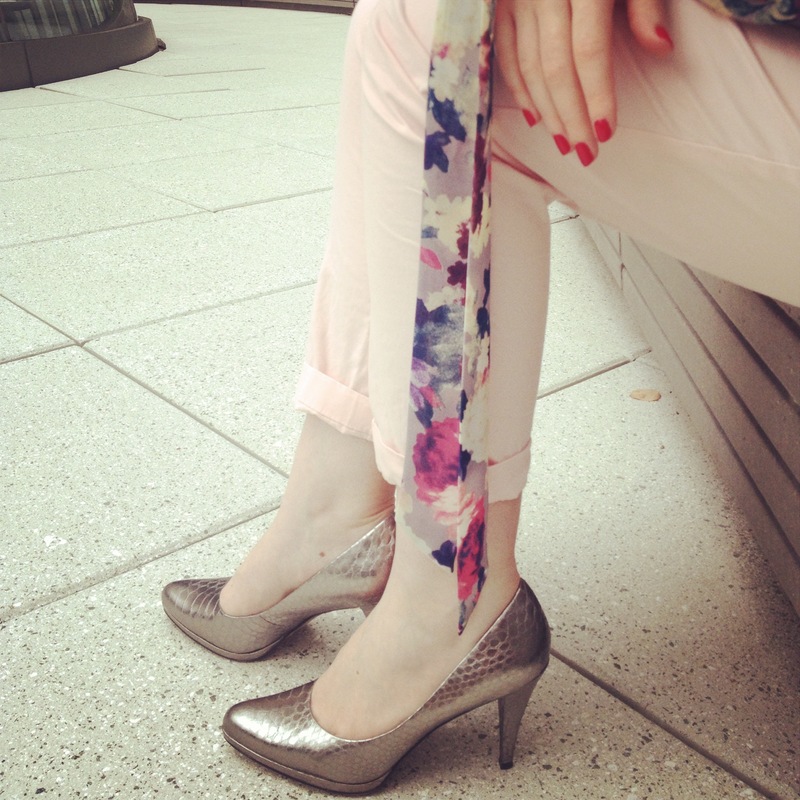 These metallic heels are great for work because they instantly dress up any work outfit. The phrase “work appropriate metallic platform heels” might sound like a complete misnomer, but with the heel not being too tall and with an otherwise conservative outfit, these heels definitely look great at work! Whenever I’m unsure about how something may look together, I just try it on. Sometimes pieces I thought would look great together look completely odd, but other things (ie metallic heels and pink khakis) end up looking like a perfect match. Thanks for visiting, readers, and for sharing in my fashion adventures! I’m always happy to be sporting ruffles and hearts, so this dress made my day! This was a gem of a find at my local consignment shop. I found this Marc by Marc Jacobs dress with the tags still attached for $23 (marked down from $300)! What? I know, I was thrilled. At $300, that dress was out of my reach, but for $23? SOLD. 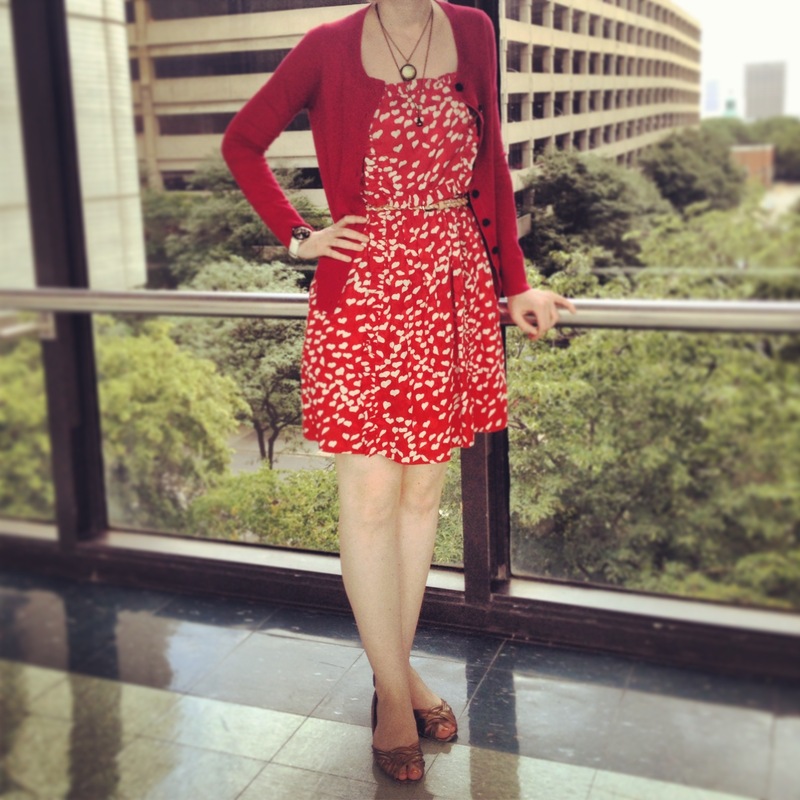 This time, I changed it up by swapping out different shoes and a different cardigan. 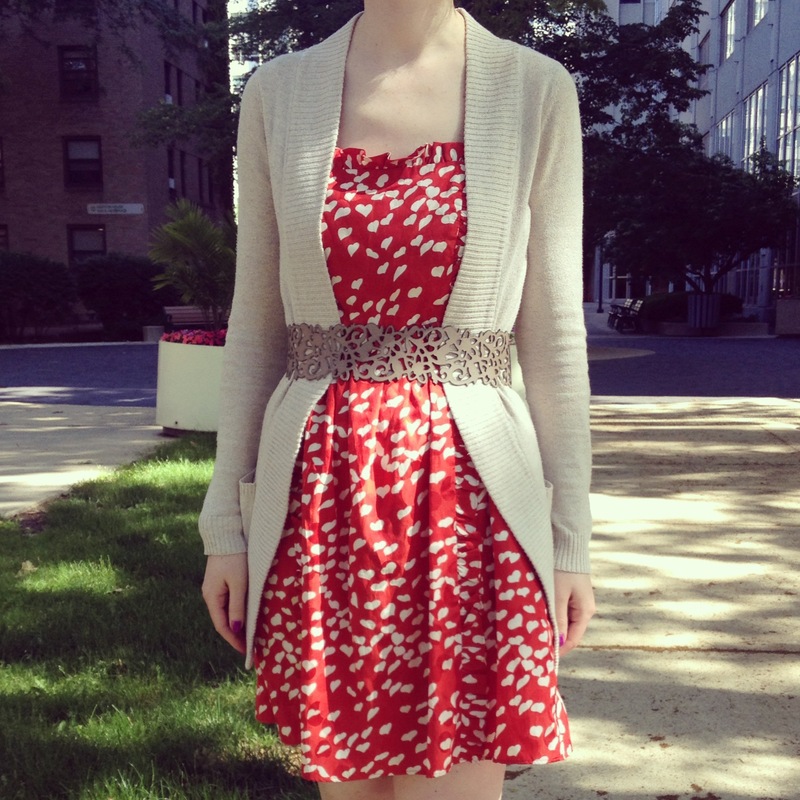 Though, this is a great summer dress without the cardigan for when I’m commuting to work! I think the ruffles on this dress really make it that much cuter. 1) It can really be tough to dress for work when summer gets exceptionally hot! 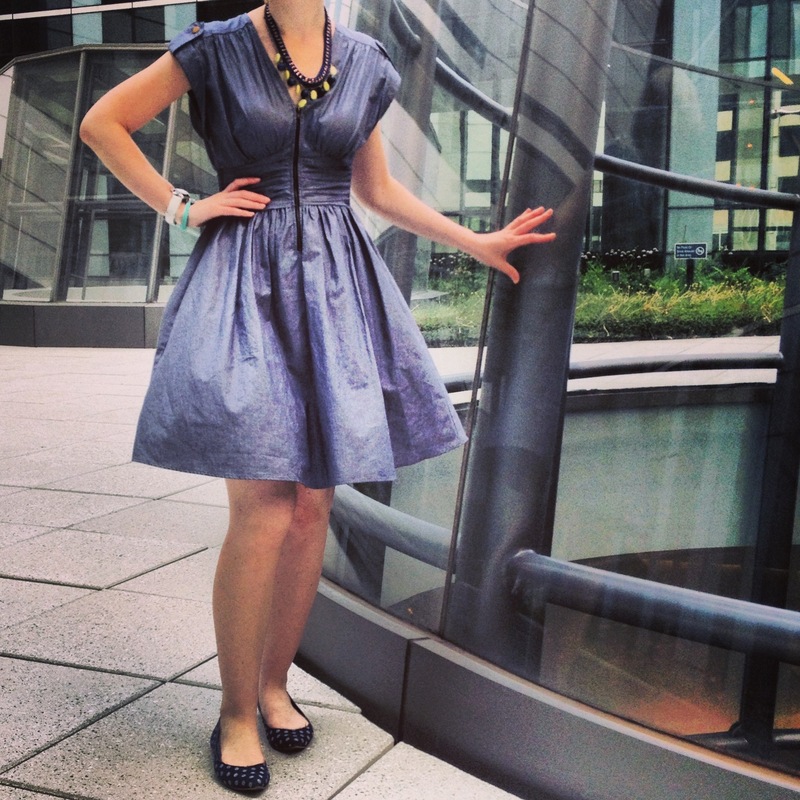 I personally aim for dresses that are knee length (or as close to it as possible) at work. In the winter, you can get away with shorter dresses if you’re wearing tights or leggings, but summer generally means bare legs and thus, slightly longer is needed. 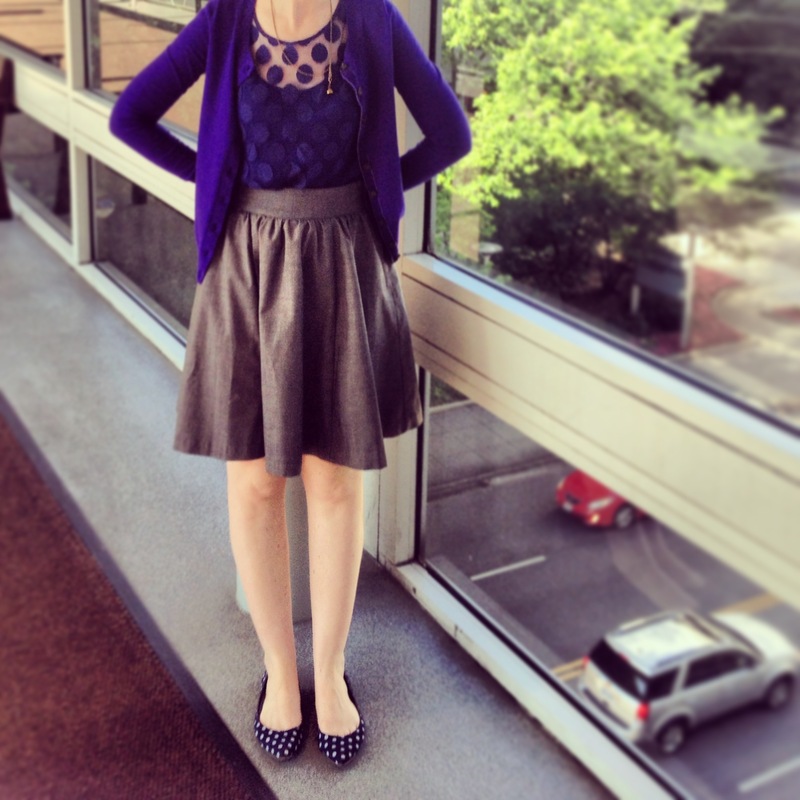 I always add a cardigan or blazer for the indoor AC and to cover my shoulders (required per our dress code). 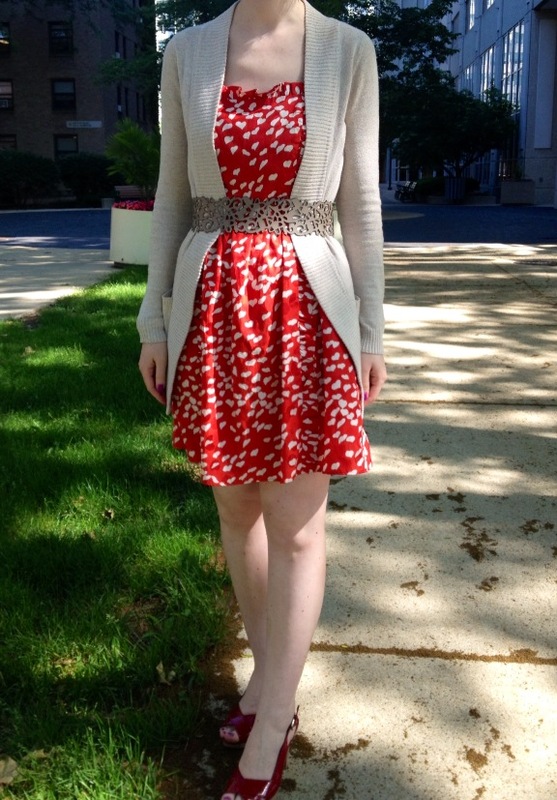 I’ve been surprised by how many dresses look completely different with a cardigan and sweater. By wearing your weekend summer dresses to work, you can get far more usage out of them, which is definitely budget friendly. 2) I was really on the fence about consignment…until I tried it! Now I’ve decided it’s actually magical. Yes, magical! 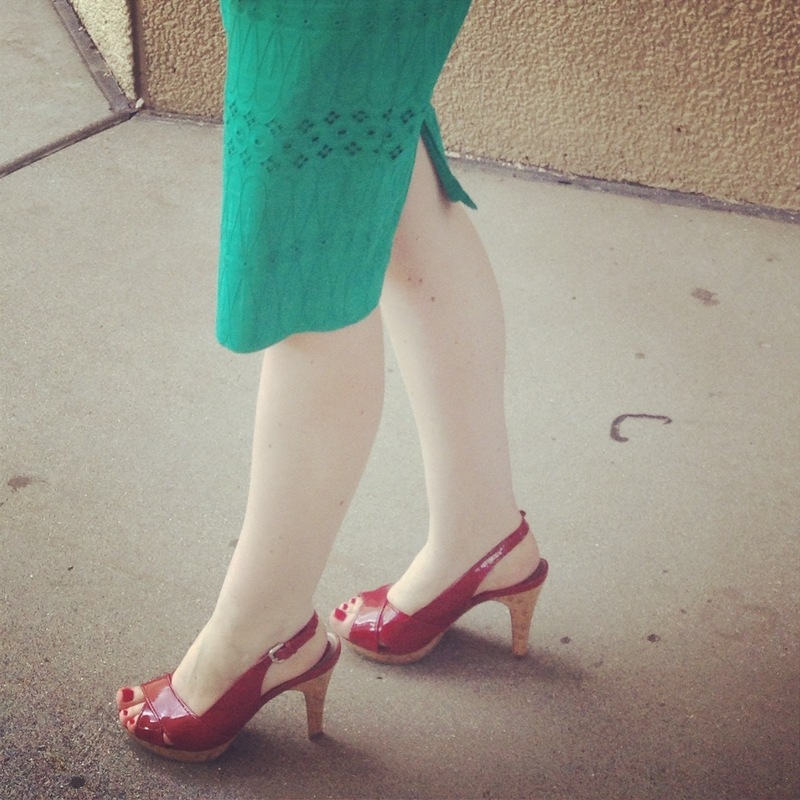 If you shop consignment in a nice area, you can find some great couture pieces, and often with tags attached. I have been asked if there is a lot of “digging” at these types of shops. My answer is always: if you go to a good store that you have researched, then no, it is not a lot of digging at all. However, some people enjoy a good dig. When I’m in the mood for digging, then I really don’t mind that type of store. However, shopping for good deals does not always mean you’re digging and spending a ton of time looking for deals! Happy mid-week, readers! We are having fabulous weather in Chicago; I hope everyone else is as well. Sunshine and a cool breeze always makes for a good start to the day. Thank you for stopping by! 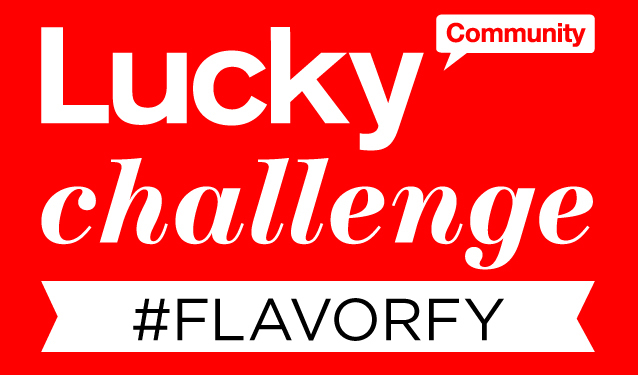 When Lucky contributors were asked to participate in a posting about a Dasani challenge that requested “showing your summer colors,” I jumped on the opportunity. Readers, you know I LOVE bold colors and prints. This maxi dress by Mimi Chica is no exception! 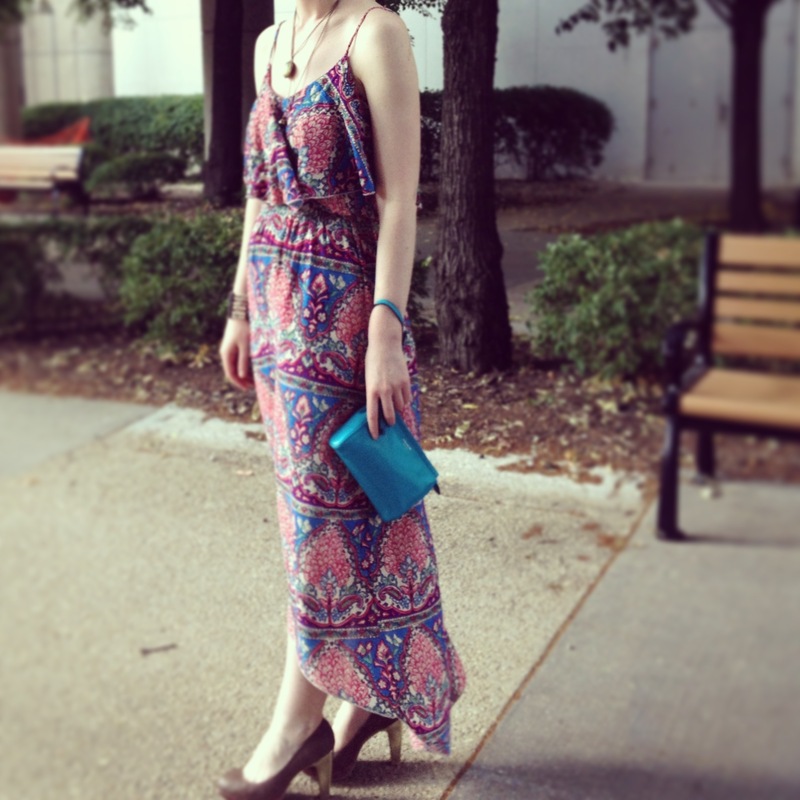 I found this lovely asymmetrical maxi dress at my favorite consignment shop for $16! I added my favorite platform heels. These lovely platforms were on ‘yellow sticker’ clearance at DSW for $12! I then added a Coach wristlet. 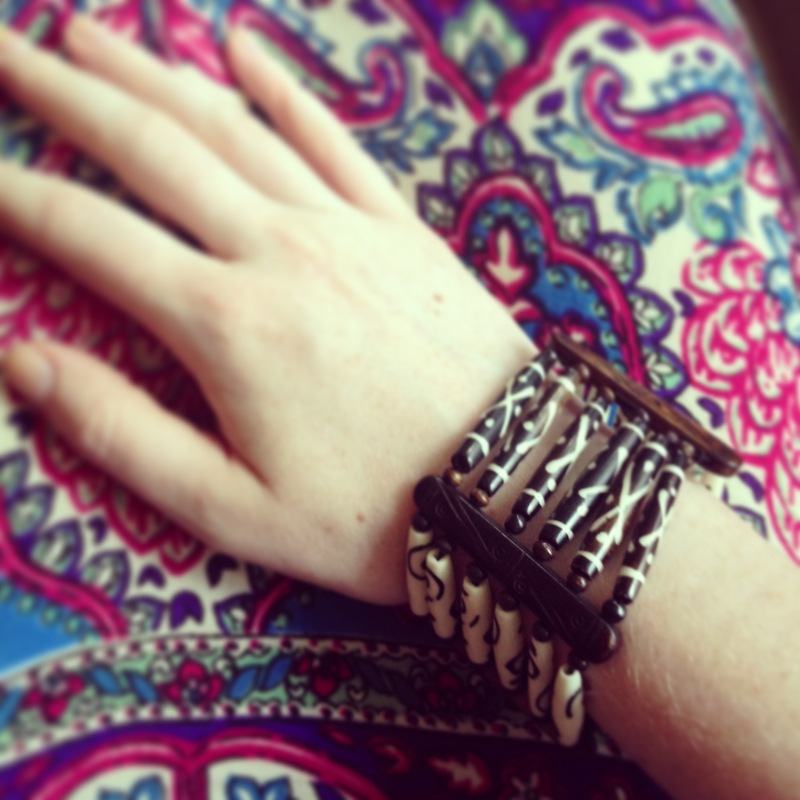 And, lastly, a bracelet that was a gift from my parents from Africa. This dress has a beautiful front and back detail with a ruffle/drape in the front and back. If there was not such a crazy heat wave here, I would have worn my cardigan. I had it with me for inside my office, but otherwise left it off outside. 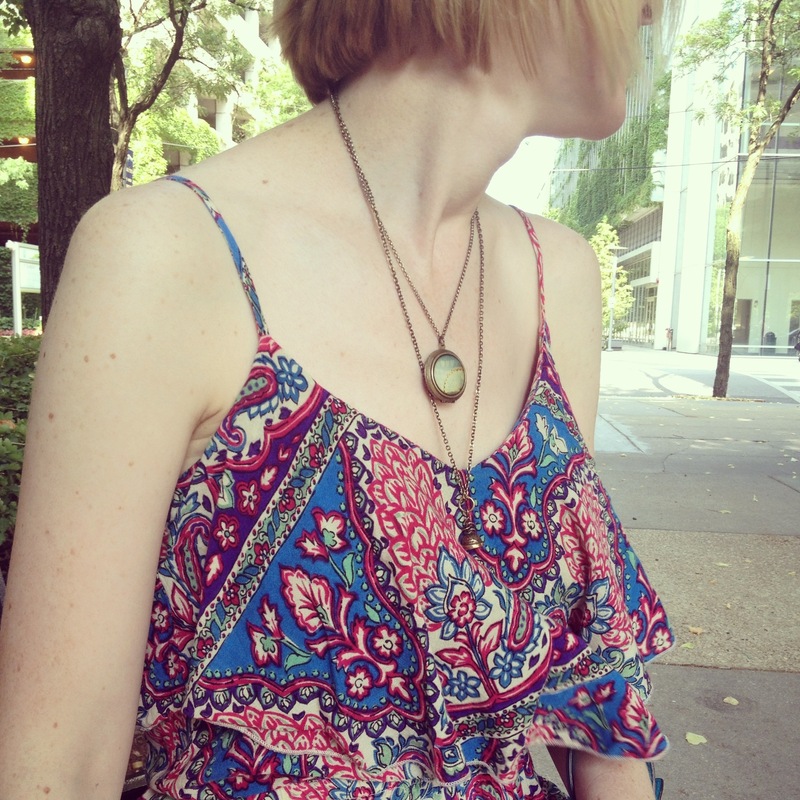 With my accessories chosen and cardigan in tow, my summer look was complete! 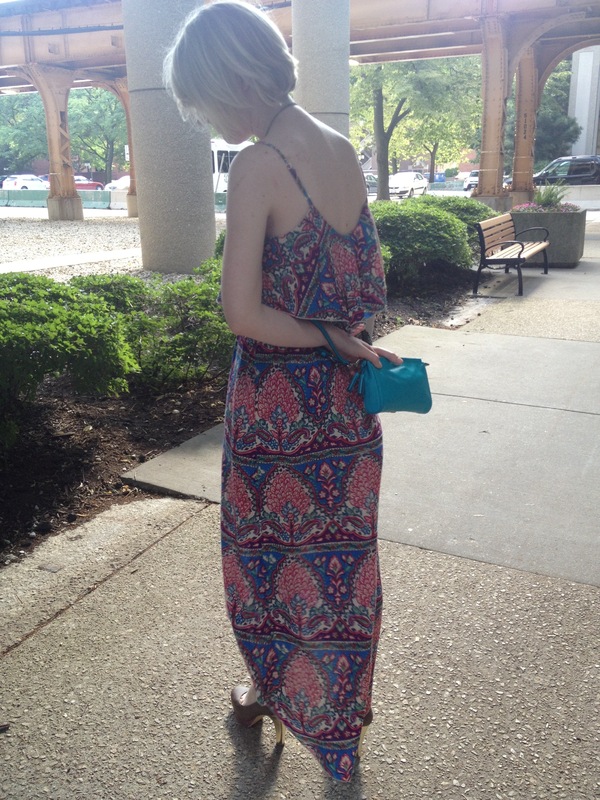 1) I was really unsure about wearing a maxi dress to work. I read some articles that said this was a definite no, and others that it was a definite yes. I decided to just try it out for myself. 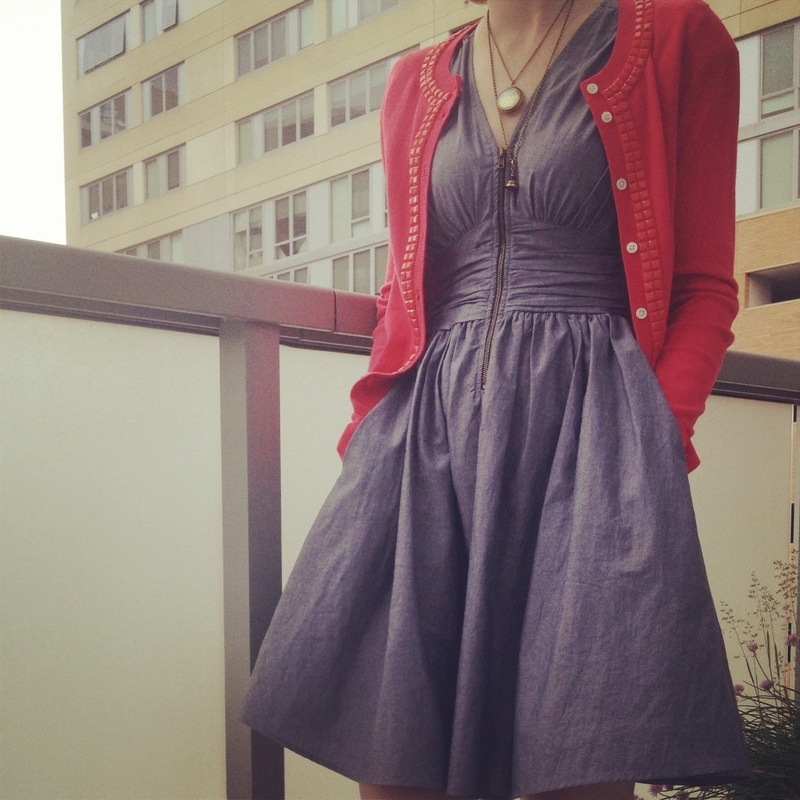 When paired with a cardigan, this dress was a definite yes at work, in my opinion. 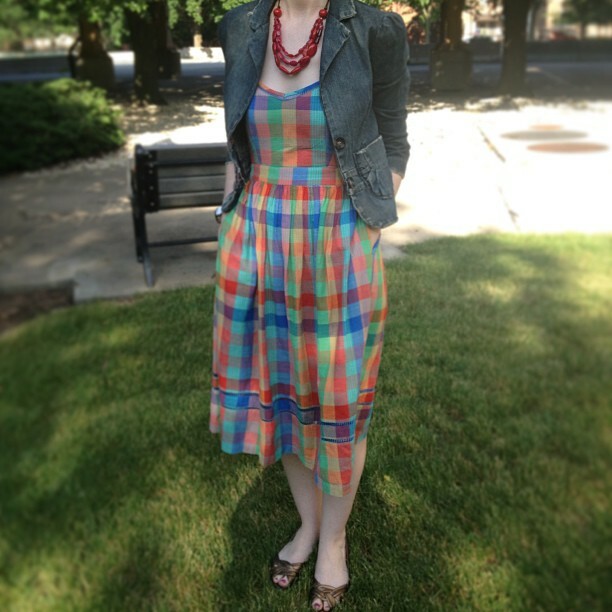 In looking through other posts and my experience, I would argue that maxi dresses are appropriate in many work settings, but that fabric is an important factor. The more beach-y, soft cotton dresses may not be appropriate for work. 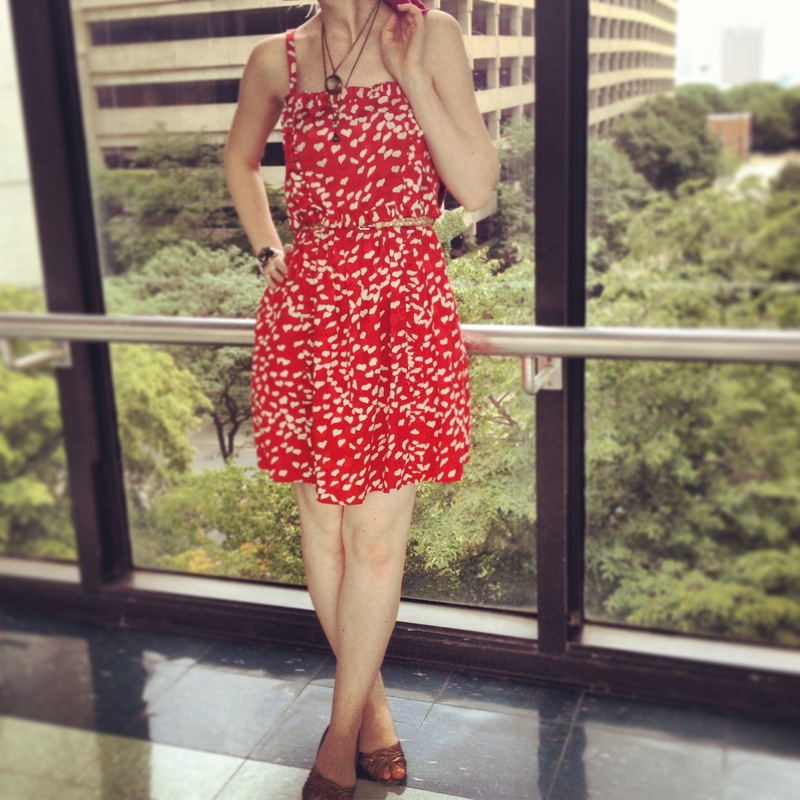 This dress, however, was a cotton/linen blend, and thus was a little more formal looking. Additionally, the cut of the dress was tailored at the waist and layered at the front and back. The cut also added to the formal appearance versus maxi dresses that are more like long t-shirts. 2) This outfit was a nice blend of high/low pieces. 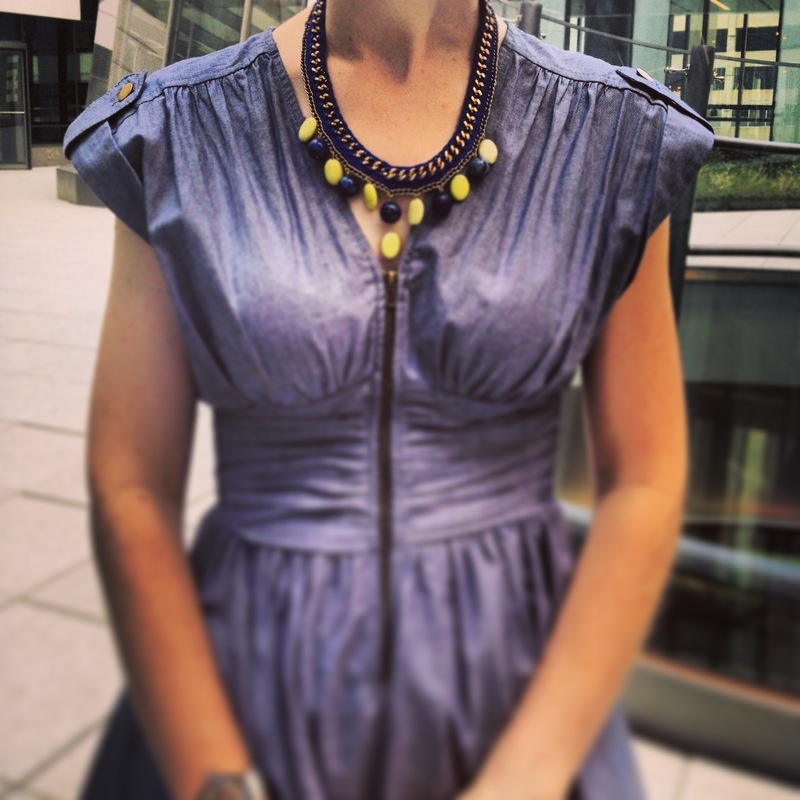 The statement piece, the dress, was found on consignment at a great price. The shoes were found on clearance during winter. 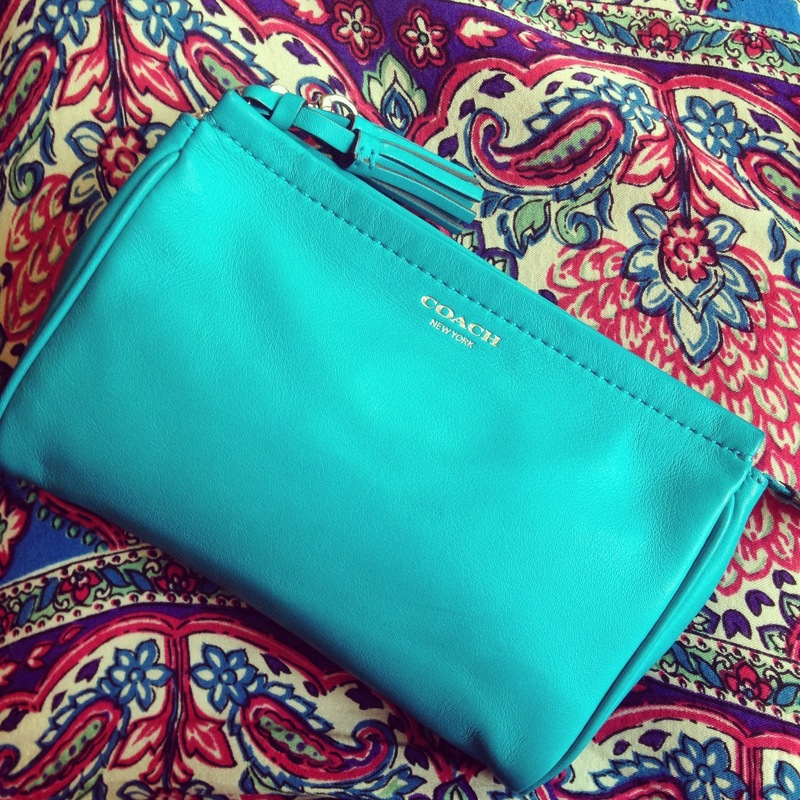 The ‘high’ piece was definitely the Coach wristlet, though even it was still on sale! You guys know by now, if you’ve been following the blog, that even when you’re mixing high and low, you can still find most pieces on sale, if not clearance. Thanks for stopping by, readers! It is time for another remix and rematch post, Fashion Huntress style! This is a special edition of remix and rematch because I have had both of the featured items for…wait for it…over five years! Yes, my friends, this is an ‘oldies but goodies/classics remain classic/giving old items a facelift’ remix and rematch. Buying high quality classic items on sale means you very well may be wearing them for years to come. If you want to see my previous editions of remix and rematch, you can click here, here, and here. 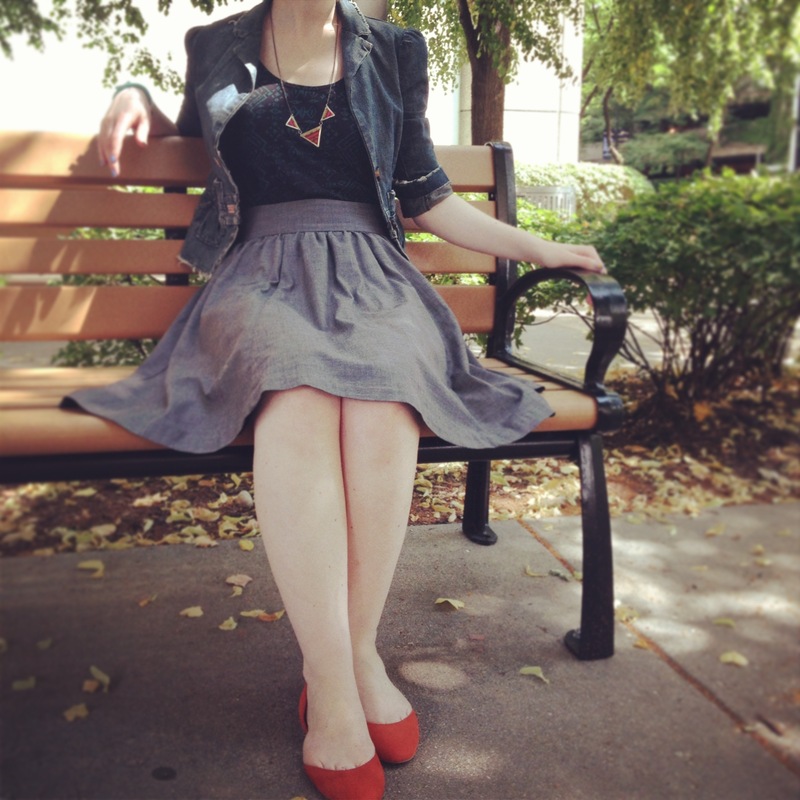 1) Most of us do not live in a world where wearing a different pair of shoes or a new skirt every day is an option. To be honest, I am not sure I would even want to live in that world! 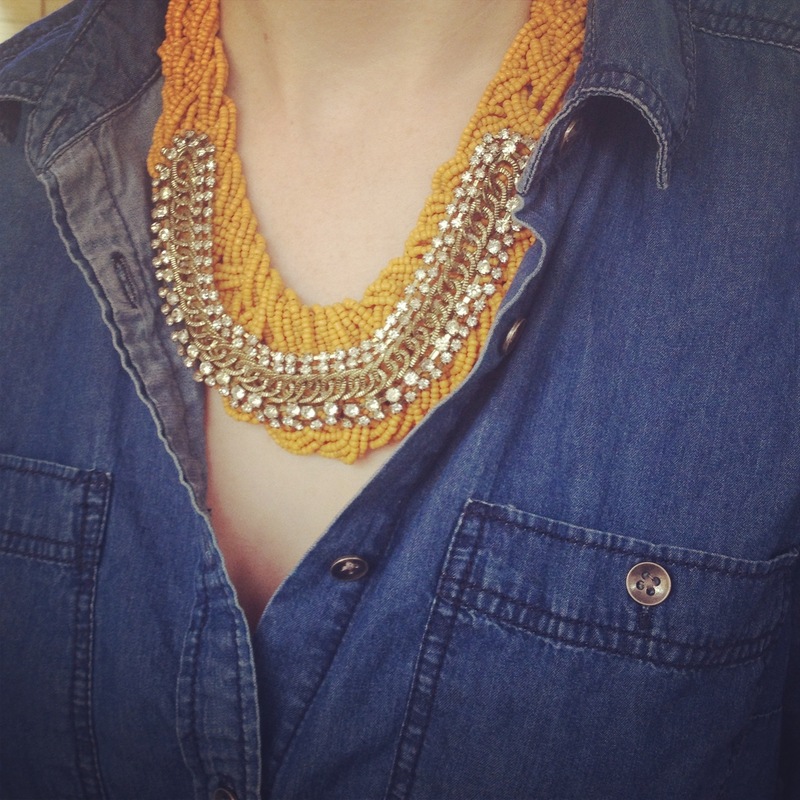 I like the challenge of remixing and rematching, and I enjoy wearing many of my pieces over and over. The real challenge is finding a way to keep your classics and older pieces looking fresh! One of the easiest ways to keep classics updated is by adding something trendy to the mix. 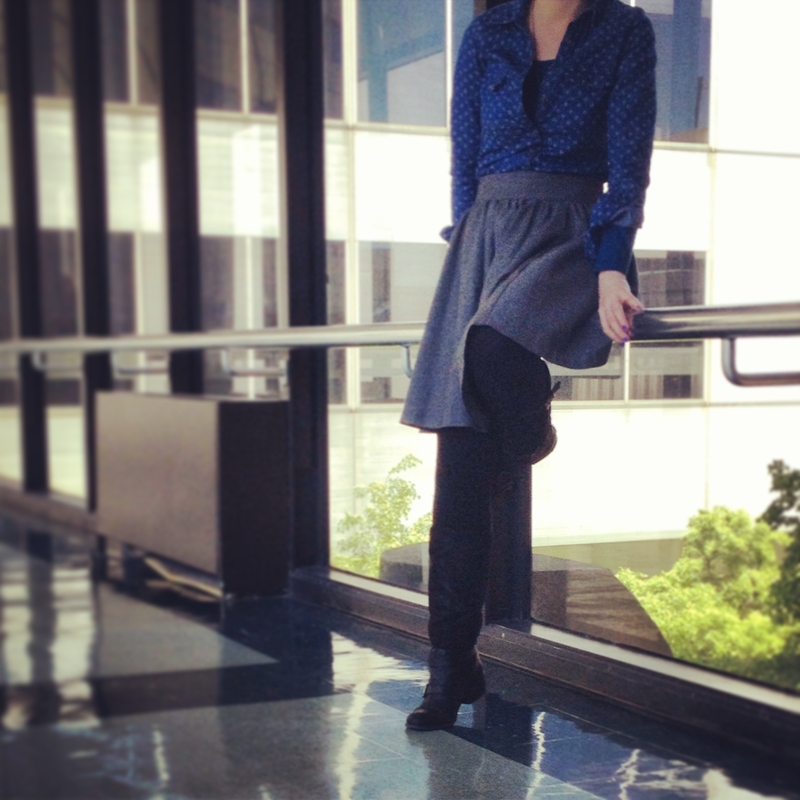 With my full skirt, I added trends of sheer polka dots, tribal prints, and printed denim. 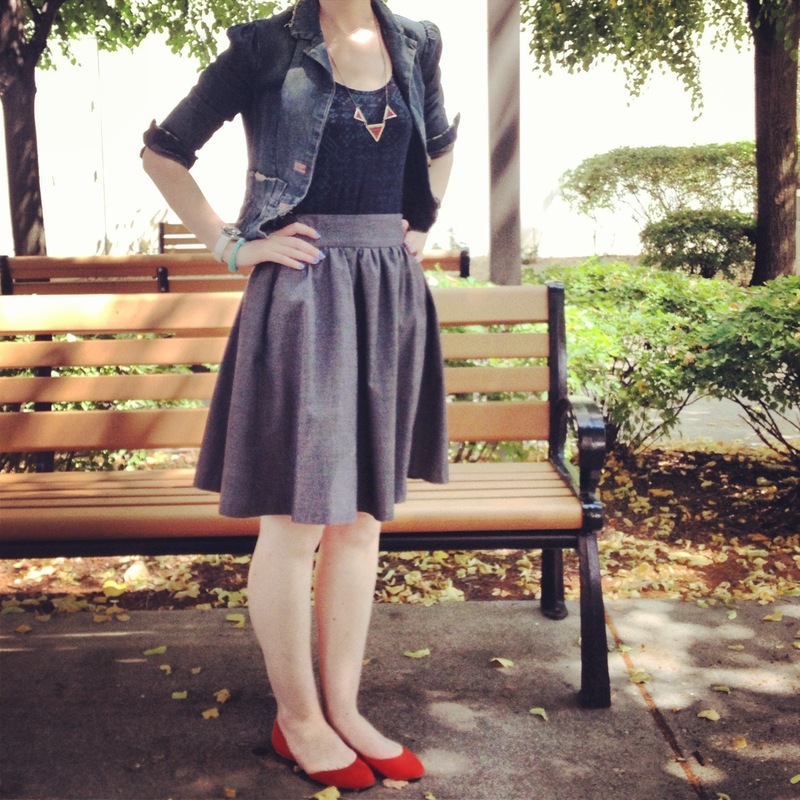 2) I am a firm believer in the jean blazer. On paper, it does not sound particularly fashionable. However, in practice, it is very fashionable! Denim never really goes out of style, so you can invest however you want. My recommendation, nonetheless, is to get something that is well tailored so that it will always look as though it fits properly. 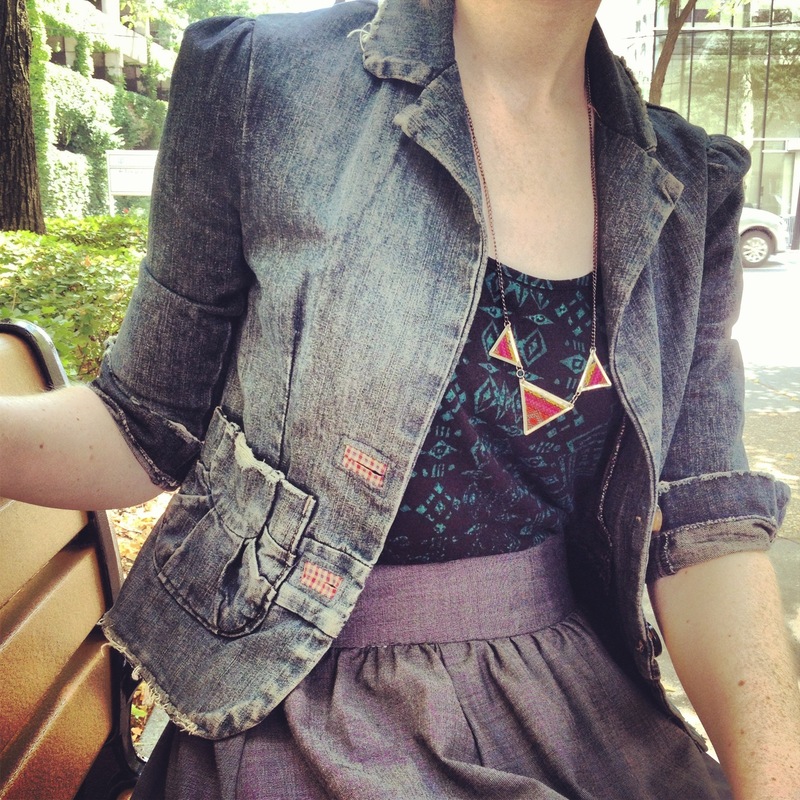 Jean blazers are a nice alternative to a black blazer (especially in summer), and are perfect for layering in summer. If you are looking for a denim blazer/jacket, I think J. Crew and Gap have great denim collections that are basically indestructible. When looking for denim that will last, look for stiffer material. Steer clear of the thinner/super soft denim that you sometimes see in jeans that also have spandex in them. The extra soft denim is fine for pants, but will not last long if used in a jacket. Thank you, as always, readers for stopping by! I hope you enjoy your weekend!